The aim of the present chapter is to bring to light and assess discussions of social reality proposed by a Japanese student of Husserl, Tomoo Otaka (1899–1956). What is most remarkable about Otaka in this regard is the fact that he conceives himself as a follower of Husserl’s transcendental phenomenology. 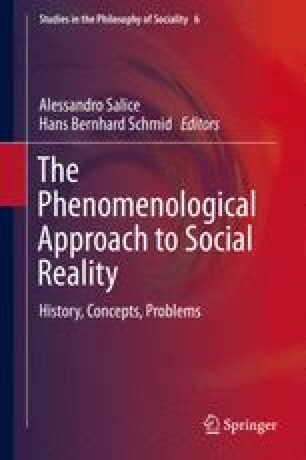 This makes him unique among early phenomenologists of sociality, as most of his phenomenological contemporaries dealt with so-called social ontological problems in a realist-ontological manner. Consequently, the following question guides the present paper: How and to what extent can Otaka’s discussions of social reality be integrated into Husserl’s project of transcendental phenomenology? Drawing mainly on his German and Japanese writings from the 1930s, we show not only that Otaka appropriates Husserl’s idea of constitutive analysis but also that he attempts to expand it; he applies Husserl’s scheme of constitutive analysis to actually existing states, such as Japan, and other social groups. At the same time, we point out that Otaka’s work faces a dilemma. On the one hand, if he sticks to the project of constitutive analysis, his account of the actuality of social groups is implausible, because it relies on the problematic idea that we can have supersensible intuition of those groups. On the other hand, if he removes the implausible portion of his analysis, it would make his position non-phenomenological according to his own Husserlian standards. This dilemma, we further argue, could have been avoided, if he adopts an alternative, but still Husserlian scheme of constitutive analysis. We are grateful to the editors of the present volume, Hans Bernhard Schmid and Alessandro Salice. Without their kind invitation, there would have been no social relations among the authors that found the actuality of our “Otaka Research Group.” Our thanks go also to Satoshi Narihara for joining our group; to Wolfgang Ertl for helping us translate German passages into English; to the anonymous reviewer of the present chapter for his/her insightful comments and suggestions; and, last but not the least, to Tim Burns for his fine proofreading that has saved us from a lot of mistakes. Both of the authors are supported by the Grant-in-Aid for Scientific Research from the Japan Society for the Promotion of Science (JSPS).